A divided Irvine City Council voted 3-2 to replace the previously-approved Great Park Veterans Cemetery with massive FivePoint Communities office and commercial projects. The development will bring an estimated 10,000 cars and trucks every day to nearby north Irvine villages, and throughout the City. On June 5th, the City of Irvine was within ten days of receiving a $30 million grant of State funds to immediately begin construction of the City- and State-approved Veterans Memorial Park and Cemetery on a 125-acre site within the Great Park. But, at a hastily-called June 6th “Special Meeting” of the Irvine City Council, Mayor Donald Wagner and Councilmembers Christina Shea and Melissa Fox voted to derail the Veterans Cemetery in the Great Park; reject $30 million in State construction funds; and prepare to transfer ownership of the 125-acre Great Park site from the City to developer FivePoint Communities — along with a grant of zoning rights, so FivePoint could quickly develop huge commercial and residential projects on the property. 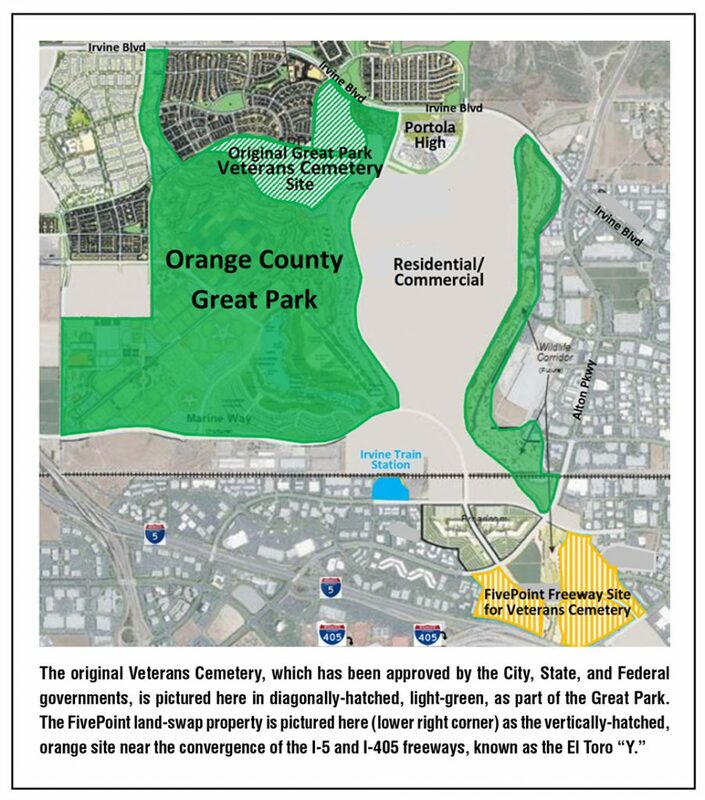 Councilmembers Jeff Lalloway and Lynn Schott voted NO, charging that this was obviously a “giveaway” of valuable City property to developer FivePoint, and that it would indefinitely delay any prospect of bringing a State-funded and State-maintained Veterans Cemetery to Irvine. Fast forward to the Tuesday night, September 26th, Irvine City Council meeting. Mayor Wagner and Councilmembers Christina Shea and Melissa Fox reaffirmed their support for the FivePoint development plan and a so-called “land-swap” and zone changes that will replace the Great Park Veterans Cemetery with large office buildings and commercial projects. Wagner, Shea and Fox ignored numerous well-reasoned pleas from Irvine residents, many of them veterans, to stay the course and build the Veterans Cemetery in the Great Park, as originally planned. Sharon Toji, a former Irvine School Board member and long-time resident, testified in support of the Great Park Veterans Cemetery, noting its historic significance. “The Great Park is where we need to commemorate our veterans,” she said. A number of residents decried the Council’s abandonment of the Great Park Veterans Cemetery as bowing to powerful special interests, specifically, developer FivePoint Communities. Patty Bartlett, a real estate authority and Chair of the Irvine Planning Commission, made clear that replacing the Great Park Veterans Cemetery with office and commercial development “would not be compatible” with either the Great Park or the surrounding residential communities. She specifically cited traffic, noise and pollution. Former Councilmember and Planning Commissioner Mary Ann Gaido said that the Planning Commission and City Council had simply failed to analyze and disclose the many “adverse environmental impacts” that would come with intensive office and commercial development. Gaido noted that the Great Park Veterans Cemetery would have generated about 500 daily automobile trips — for occasional memorial services and visitations. On the other hand, the proposed FivePoint commercial development at the Great Park site would generate an estimated 8,500 average daily trips, causing still worse traffic along Irvine Boulevard, Sand Canyon, and throughout north Irvine. Is the City Council Inviting a Lawsuit? Agran warned that the Council’s disregard of proper procedures and the requirements of the California Environmental Quality Act (CEQA) were sure to invite a lawsuit. Councilmember Lynn Schott who has previously called the FivePoint development proposal “a giveaway of our Great Park,” joined Lalloway in voting NO. Mayor Donald Wagner, and Councilmembers Christina Shea and Melissa Fox voted YES. State law requires that yet one more vote — at the October 10th City Council meeting — is required for a land-use matter of this importance. Click here to sign the Veterans Cemetery Petition!